It may seem weird that our thoughts and emotions can be linked to our stomach, but it turns out that they actually are! 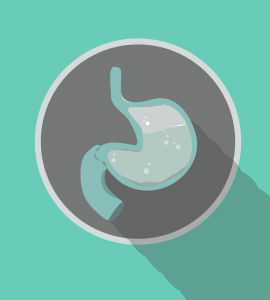 The gut-brain connection is a real thing! Our brains are constantly talking to other parts of our bodies. For example, they send signals to our stomachs that food is coming — this triggers the stomach to start making stomach acids to digest our food. But the connection is two-way: our guts also talk to our brains! The gut itself has tons of neurons, the same types of cells that make up your brain. This nervous system in your gut, known as the enteric nervous system, is so large and complex that it is often nicknamed as the “second brain.” It can even function independently of our brains! (Though to be clear, it cannot have conscious thoughts, it is just responsible for making sure we digest our food correctly). While our guts may not have their own thoughts or moods, they do communicate back to our brains and may help influence our moods. For example, one form of treatment for treatment-resistant depression is stimulation of the vagus nerve, one of the large nerves that connects the brain to the digestive tract, which includes the gut. There are a few reasons why our guts may influence our mental states. One reason is that our gut’s nervous system uses the same chemicals (neurotransmitters) that our brains use and that are part of mental health problems. For example, the gut nervous system produces serotonin, a neurotransmitter involved with depression. In fact, about 95% of the serotonin in our bodies is manufactured in the gut (the other 5% is in the brain)! It is possible that part of the communication between the gut and the brain could be through the exchange of these chemicals. Alternatively, it is also why some depression medications, such as Selective Serotonin Reuptake Inhibitors (SSRI’s), can have effects on your gut and bowel movements. A second way is through the critters living in our gut. Our guts are lined with trillions of bacteria and other microorganisms. If we counted the number of bacterial cells to human cells in our body, they would outnumber us by a lot! These bacteria are generally peaceful — in fact, we need them to digest foods that we can’t, like fiber, and to give us certain types of vitamins. But they also give us some other things than can affect our brains. Some bacteria give off low levels of toxic products, not toxic enough to hurt us, but enough to cause low-level inflammation in the body. This type of inflammation has been associated with many chronic illnesses like diabetes and heart disease, but it also is associated with mental health disorders. This is because chronic inflammation causes our cells to start acting incorrectly, and it could magnify any underlying issues that we already have. Do you want to guess what other type of chemicals gut bacteria produce? Ding ding ding! You got it — serotonin! Not only can gut bacteria produce serotonin, they also influence how our own guts make serotonin! So, our guts have some influence on our brains! Cool, right? This of course isn’t to suggest that our guts are the source of all problems. Rather, one of the ways that we can help keep our symptoms in check is to listen to what our guts are telling us, and to treat them right through healthy eating and exercise! Trust me — I have a gut feeling about this! Have you noticed if your stomach gets upset when you’re feeling anxious or nervous? Do you trust your “gut feelings?” What do you think you can do for your stomach that can also help your mind? Could Your Diet Be Affecting Your Depression?